James Kenneth McMahan, of Cliffside, one of Rutherford county’s youngest attorneys-at-law, is active in the civic life of his community and county. He was born October 9. 1911, in the Mt. Pleasant community of Rutherford county, a son of the late A. W. and Hessie (Blanton) McMahan. He received his education in the elementary school of Forest City and Cliffside, and graduated from the Cliffside high school in the class of 1930. Following that, he worked for sometime in the Cliffside Mills and various departments of Cliffside Mills Department Store. From there he went to the Community Store at Avondale where he was employed for eighteen months. It was while there that Mr. McMahan decided to begin the study of law. After making that decision, he spent many long hours in the study of law through an extension course and in the office of Hon. Oscar J. Moooneyham. At length, he stood the state bar examination, and passed on August 23, 1934. 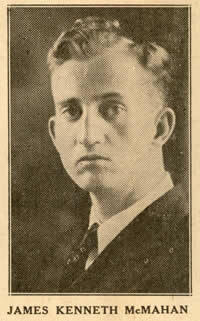 He took the necessary oaths and was admitted to practice at the September 1934, term of Rutherford county court. He was one of the forty-six successful applicants to pass the state bar exam in August, out of a class of 108 aspirants. He was the first attorney in Rutherford county to be admitted to the bar under the Board of Examiners created under the act of the 1933 General Assembly. In the fall of 1934 Mr. McMahan opened a law office in Cliffside, where he continues to practice. After admission to the bar he continued the study of law and upon the completion of three years law course through LaSalle Extension University, he was awarded an LL.B degree from that institution on April 29th, 1936. Mr. McMahan is a member of the Cliffside Methodist church, where has served as assistant superintendent of the Sunday school and at present is supply teacher. He holds membership in the Woodmen of the World, the North Carolina State Bar Association, Inc., Eighteenth Judicial District Bar Association, and the Rutherford County Bar Association. He is now serving his second term as secretary-treasurer of the Rutherford County Bar Association. He was the organizer and first president of the Rutherford County Young Republican Voters’ Club, and at present is a member of the Rutherford County Republican Executive, Committee as chairman from High Shoals township, being the youngest member of this ‘Committee. Mr. McMahan married Miss Osteen Wood on December 24th, 1936. In addition to general practice of law he has held a position with the Cliffside Mills supply department for sometime. This item was printed in The Forest City Courier on March 16, 1939. Copy provided by James Harris.